-v. 63, no. 20 (May 18, 1990). Editor: Fred K. Shochet, <1959>. Description based on: Vol. 5, no. 47 (Nov. 25, 1932). jsized and needs to be defended. deepest and truest paradoxes of th"
there were no Jews left in Spain. toms of a perishing civilization. to the memory of this great leader. present situation in Palestine, Dr.
hatred between Jews and Arabs,"
paring to distribute the principal. a behind-the-scenes tug of war '. funds are allotted to .lews. Mr.
Friedsam. who was president of B.
Altman and Co., died in 1981.
sion, it may "presumably interpret"
will not be deflected by violence. peacefully with the Arab people." sonal campaign $2,250,000 in cash. Fund has been put into action." work is "woven in the fabric of his. 1 The admission charcc nf . I.each on the day of the off.- . no interest will be charged. On ect begun by the inventor before of social events forthe summer. hi ie,i to a committee consisting of ison Foundation committee. I of the dance will be the 'lance con. reau is local placing agency for the and flexible." Mr. Phillips said. the -urn of $100 was given to the research work of the individual. to Hot Springs on June 10th. Sholem Temple, Tampa, 1'la. ; R(v.
Rabbi and Mrs. Max Shapiro will school or industry who have dem- to Emanuel Seiderman. son of Mr.
vacation. The rabbi will attend ment." S. W. Twenty-sixth st.
the organization wore discussed, and John I). Harris. St. Petersburg Miami. the junior division of the V. M. 11. Havana last week. Saturdays, when they will open at test will be featured. tives and friends for several weeks. will take place in June. mother, Mr-. Edward M. Re. and Mrs. P. .!. Colbert. Washington Ave & Fifth St.
of Newark, N. J., was ..
with a linen shower lasl w. .
relatives and friends in Boston. Venire, Miami Beacn, on Sunday, ,h,'il' honu's ear,J *l "ion,. June 14th, beginning at HI a. m.
'ts with one-way stretch! Whit.-. aqua, black, pink. Jersey lined. 32 to 38. Ind ; Adolph J Feinberg. Clnvtand; Eric Friedland, Paiettem. D. Shaw, a'imji City, Ami, Myron Sihemun. Piditutgk. |vorahle effect on public opinion of (he rabbinate as a whole. the Jews on a situation which has long needed cleaning up. houM be invested before the eyes of the world. [rouse the public to repudiation of these religious racketeers. Iradation it is possible for the commercial rabbis to sink. of the religious activities of oUr own community lest we he [ng, ,,ljs Sunday. .lon leading the pack with two hits. shore can use your moral support. seph, Dan Satan and Sol Fordun. Good luck to you all, graduates. studentsthe largest class in degrees. back by winning their las'. ing the women's division is Mrs.
June 3rd, at the "Y" clubrooms. ported by the Junior HadasSah. 1 thur Blatt and Harry Rose. be well assured by their efforts. SI Aid Society an ! Co-chairman was Mrs. Milton L.
Hollins. ami assisting were: Mrs.
i. Sloat, Mrs. J. T. Wilensky, Mrs.
Witten, Mrs. A! Stein, Mrs. M.
Stein, Mrs. Sidney Schain, Mrs.
enthal and Mrs. Reuben Rosenberg. panied at the piano by Miss A. Special awards were won by Mrs.
E. Carnot. Mrs. P. L. Samson Mrs.
Mr. and Mrs. Frank Rabin, Mr.
B. Rabin, home of Mr. and Mr.-. Harry A.
: by J. C. Little, ..
Mrs. !'. L. Goldberg. Mrs. B. H.
Jacobs, Mrs. O. Silverman, Mrs. B.
Friday night at 8 'clock. Cause foot, leg, back pains. i ikies an 1 a fruit juice J ink. The Uniti I Jewis .'. Dale Arden Salsbury, born May 1 '. at the Tampa Municipal Hospital. mother cf Dr. Augustine, and Mrs.
Dr. and Mrs. L. S. Augustine. end in Miami and Miami Beach. by the Jewish Labor Committee. The Jewish athletic program is de. ; ments in the world of sports. ices at Temple and Synagogues. ciation announces the resignation of Mr. J. T.
of Mr. Joe Roherts to the position. the World Jewish Congress . 1 Zionist Dr. Stephen S.
to admit the late Adolph S. Ochr. dy Plant for their essays. ident of the congregation, present. tended bj parents and friends. were Leonard Lewis, Betty l'-'ndid services in playing the or. past year in the Religious school. out their national salvation" . tee of the American Mizrachi, Mr.
shares and payment of dividends. ly Rubin, Danny Kohl and Bobby : Kaplan, our new president, and en- fusal to run for a third term . II. Kaplan of Temple Israel. class 1, Louis Wolfson and Benja- ent. I, Bet nadine Both; class -. many times the required legal reserves. quiry. Do not speculate with your savings. 1233 N. E. 2ND AVE.
curvature of the surface which con- ! I ase of the window, it is explained. is now visible from the sidewalk. day. June (ith. Id p. m.
SIMMER RATES od>\nd frndcr work, t.p and atal cover,. 1212 N. E. Second Ave. IN N. E. First Ave.
her. too: th,s beautiful, 5 cu. ft.
NEW FAMILY SIZE ELECTROLUX-5 CU. FT. PEOPLES WATER & GAS CO.
4/4/2013 10:22:57 AM Item title is required but not supplied! % jffl I ... L036 THE JEWISH FLORIDIAN Page Three & Jewish Florid fan ILOR1DASONLY . 'l:W|>H WhKKLY $C*  PUBLISHED EVERY I ItlUAY by the JEWI8H FLORIDIAN PUBLISHING CO I" (). Box Bldg. Miami, Pla. EDITORIAL OFFICES : J. LOUIS SHOCHET, Editor I UK!) K. SHOCHET, Circulation Minanr CANTOR BORIS SCHLACHHAN Field Representative Phone 2-5304 Phone 2-11-:; t.i-i.fi ,. ,..n,l clau rnnltiT July I. 1080, % the Poal Office' at Miami, Floridn under thr Ait of March I, 1879, sT PETERSBURG | MBS ROSE M. RUBIN Representative WKST PALM BEACH MRS. M. SCHREBNH K Representative ORLANDO UBS. B. J. COHEN Representative TAMPA MRS. M. H. KISLER Representative (too Yi-iir SUBSCRIPTION FRIDAY, JINK :,. 193fi Vol. 9No. 2.1 ftgS* %  13 MEN v BECOME RABBIS AT HUKCW UNION COLLEGE Viih the ordination of the* 13 men Into the rabbinate on Mi) j. the graduate* of the Hebrew Union College, tin. ininn. kill tool (Oi. Reading from left to right the memben of % he tliM Ere: IT ROW. %dney M. rVikowiti. Tft Haute, Ind ; Adolph J Feinberg. Clnvtand; Eric Friedland, Paiettem. ,V. } 1 Roland 11 Giicetiohn. Cleveland; Samuel CUinu. Ph,ladelphia. SECOSD ROW. Bertram Kliumer. Xewaak, S. /' Button F_ Lctiruon. Cleveland; George B. Lieberman, Cleveland; Maurice Lyont, Clexeland; Jacob M. Rothachild. Pillt)'"*'> THIRD ROW. Eugene Sack. Gtovernnttt. .V. Y.; Abraham D. Shaw, A'IMJI City, AMI, Myron Sihemun. Piditutgk. MIAMI NOTES By HARRY SCHWARTZ If you are interested in the future welfare of the "Y," then you I no doubt will be present at the I Royal Palm Gob j this Sunday, June 7th. You can help greatly by attending and thereby make this affair, which is the first presentation of a dance and frolic given by the women's division, a huge success, as well as honor the newly elected officers. Admission is $1 per couple, which will reward you with a splendid floor show and a fine orReligious Racketeers New York's latest and choicest scandal involves a rabbi land his secretary, who are said to have received huge sums lof money from credulous folk on the East Side who wished Ito purchase a "Mitzvah," or in some cases hoped to obtain % relief from some ailment. 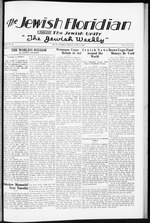 New York papers are making capital of the' item, and the resultant publicity is having; no fa|vorahle effect on public opinion of (he rabbinate as a whole. Whether there is justification for criminal proceedings in [this case or not, it should certainly serve to focus attention if the Jews on a situation which has long needed cleaning up. I Indiscriminate use of the title "rabbi" by men whose sole % Qualification for the position sometimes is only a beard, is Itendmg lo cheapen this honorable profession and to detract [from the* dignity and prestige with which ministers of God houM be invested before the eyes of the world. Honorable men, spiritual men, who have dedicated their llires to the religious welfare of mankind, sujffer by being I classed in the same category with business sharpers mas|<)uerading as rabbis, and with Hebrew teachers, chicken jhterers, mohels and shadchanim, many of whom also |Asumr the respected titleWhile in the long run a state law against improper use the title, with strict penalties for violation, would doubtIleus have effect in removing this nuisance, it is to be hoped (here will he no necessity for thus airing our difficulties. The [Jewish community itself should clean house, and under the [leadership of both leading rnbbis and prominent laymen [rouse the public to repudiation of these religious racketeers. The New York case has revealed to what depths of degIradation it is possible for the commercial rabbis to sink. There are always thousands of gullible people ready to be c jJ s t ni for your dancing, taken in by any exaggerated claims, and ready to pay for all Ba || oons prizes and favors of all sorts of superstitious fetishes palmed off in the name of res)ils win hc distributed and a I'ipon. grand prise will be awarded the The non-Jewish world, unaware of our lack of control winncl s lf tnt m ain event, which over adoption of the revered title, are ready to take at face wi  ll( a dance contest Need I value any who call themselves rabbi. At Passover time we sav m ,,,.,. ,, W(lU id be fine for each are deluged by a flock of labels attesting to the Kashruth of of voll , g. et a little party of two foods, and signed by rabbis by the dozen, most of whom we 1 or | hrep couples together and make have never heard of. This imposition must cease. There must be regulation of the religious activities of oUr own community lest we he [ng ,, ljs Sunday. faced with a scandal which will blacken the character of Jewry. Those men who have no right to speak with authority must he stripped of their titles or face community ostracism. \\ t are familiar with several scholarly and educated men who have everv right to use the title rabbi, hut WHO reject that right, lest thev be classified with the racketeers and shochtim. ., ,. ... If the community is still indifferent, and if the raohis themselves fail to take action, it might be necessary to invoke the law and call for a public clean-up. Let us awake to his festering evil in our midst and clean house.(Kcprint, "ttton Jewish Advocate, May 26, 1936.) Perhaps even we in Miami might take this to heart berorejt becomes too late. the colleges history-arc to be graduated. Addresses will be delivered bv Dr. Bernard Revel, president, and Dr. John H. Finley .associate editor of the New York Times. Dr. Finley will also present, the candidates for honorary lllar catches yet seen this season % ind robbed the hitter of a cinch home run. All told, the boys garnered eight hits off the delivery of three pitchers, with Harry Gol.lon leading the pack with two hits. Watch for the game with the first place WIOD team, as the boys shore can use your moral support. -'Mb Jew Killed in Palestine Disorder Continues Do not fail to attend the junior division barn dance, which will be held Monday, June 15th, at the "Y" clubrooms. This affair is being held in honoring the Jewish graduates of Greater Miami high schools. Below is a list of the juior division members who are graduating June 12: Jerry Bass, Sarah Lehrman, Alberta Tannenbaum, Mildred Zinn, Romlyn Friedman, Bob Richter, Julia Patterson, Sylvia Reichich, Arnold Greenfield, Ben Werner, Esther Weiner, Frank Berg, Dot Davis, Julius F.rstling, Sidney Levine, Jeanette Kronenfeld, William Joseph, Dan Satan and Sol Fordun. Good luck to you all, graduates. your business to attend ami join in the celebration and merrymakromc three .500 rating place. Flooring, the !" hlva College, Amsterdam ave. nd 186th st., New York, the only Co ege of liberal arts and sciences "nder Jewish auspices, will hold its lh mual commencement Tuesd y. June 16th, at 4 p. m., in the auditorium of the college. Thirtyone studentsthe largest class in degrees. DIAMONDBALL NEWS After be'nr defeated in their first three games, the "Y" diamondball team made a determined back by winning their las'. tarts, which gave them a and a tie for fourth 1 their game with Walton Y" came from belind to tie the score in the ninth inning, and Nat Blumberg's second hit of the game scored Bernie Frank with the deciding run to win by a score of 7 to 6. The pitching of Marry Mantell, who was making his first start for the "Y," was commendable, as was the relief pitching of Al Berkowitz. Tuesday the "Y" defeated Miami Beach Merchants by a score of 10 to 5. Davis Lackawitz undoubtedly made one of the most spectacOne of the gayest affairs ever planned by the "Y" is presently under way, with the combined groups of the "Y" each lending their assistance in the task of preparing for a picnic and all-day outing with games of all kinds and dancing, etc., to entertain the crowds. Either July 4th or July 5th will be the date selected for this picnic. Heading the women's division is Mrs. Morris, assisted by Mrs. Jules Wilson, Mrs. Sam Shindel and Miss Ruth Davis. Watch this column for more detailed information. Jerusalem (WNS-Paleor Agency) Death struck down a Jew for the twenty-eighth time since the Palcstirif disorders started on April r.uh, when Rahman Kalantaroff, 2!-year-otd student at the Hebrew University in Jerusalem, succumbed to bullet wounds after being caught in a Maze of rifle fire I while riding in a bos outside of % .li-in.sitr.-iit. Kalantaroff was a re' cent immigrant from Samarkand, Bnenara. The derailing of a Ineumotive of B train going from Jerusalem to Jaffa has caused the suspension of all traia service between the two cities. The engine was thrown from the tracks when it crashed into a stacae barriraxte which had been elected across the line half way between Jerusalem and the nearby Arab vfflsge of E.yrfcia. No casualties were reported. Shooting at Jewish institutions, burning of crops and gun fire between Arab terrorists ami military patrols were reported. Official Y. M. H. A. Annual Election Results E. Albert Rosenfeld was honored with the office of president at the annual election held Wednesday, June 3rd, at the "Y" clubrooms. Other officers elected were: Vice president, Frank Rose; Secretary Peter Silverman was re-elected, and Treasurer Harry Blumin; four elected to the board of directors for the 3-year term, Alvin Grossman, Phil Berkowitz, Ben Serkin and Joseph Davis; four elected to the board of directors for the 2year term, Sam Seitlin, Albert Reisman, Milton Friedman and Harry Schwartz; three elected to the board of directors for the 1year term, Albert Berkowitz, ArBnrauig of American Property Brines l'mi,-.i to U. S. Consul Jerasalem (WNS-PaJcor Agency > The burning of property and shooting on the American financed children's village of Shefeya, in Samaria, brought a protest tonight to Leland B. Morris, acting Ameri, can consul general, who received a telegram informing of the attack by Arabs, as did Sir Arthur Wauehope, Palestine high commissioner. The peaceful little settlement was alarmed as flames began to envelop the barns. Police, hastily summoned, started an interchange of rifle fire with the incendiaries, I who were finally driven off. Shefeya, at which boys and girls are trained to become farmers, and at which a number of youthful GerI man-Jewish refugees have been placed recently, is completely supported by the Junior HadasSah. I ^^^^"~~~^^~~~  1 thur Blatt and Harry Rose. Political comment: If the win' ning candidates show one-half of the enthusiasm put forth in get1 ting elected, after they are int stalled the future of the "Y" can be well assured by their efforts.